Gear up for a thrilling adventure to recover a legendary flying machine. Forbidden Desert sends players in search of a buried flying machine that they must find and rebuild to survive. There are 3 different ways to lose this cooperative game and only 1 way to win. In order to win players must locate and dig out of the sand 4 machine parts. They must grab al 4 parts and get to the flying machine with them to escape and win. The desert will conquer the team of adventurers if any 1 team member runs out of water, or the sand storm meter rises above 6, or there are not enough sand markers to cover the areas buried in the latest storm. It looks like there will be plenty of sand markers, but players will quickly learn there may not enough. 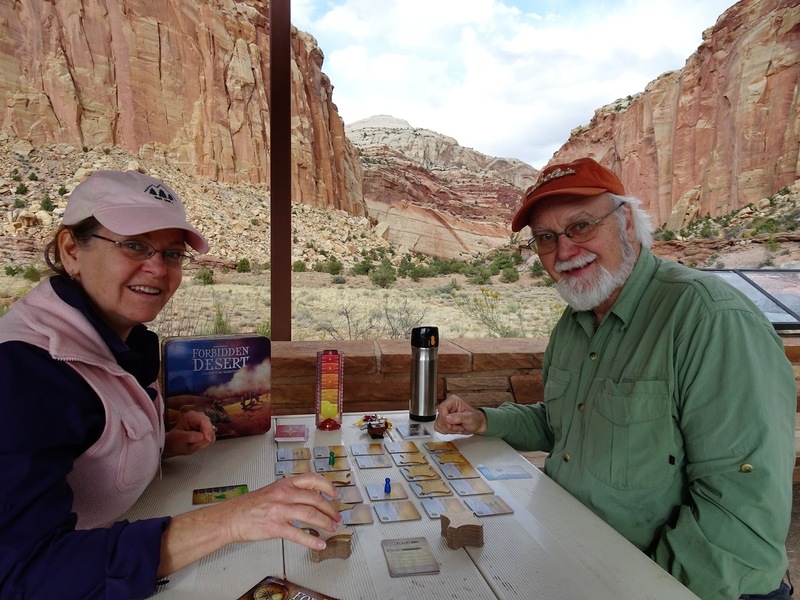 The game begins with each player getting a character card with its own special ability. The roles are: archeologist, climber, explorer, meteorologist, navigator, and water carrier. The board consists of desert tiles randomly set in a 5.5 grid with the center spot vacant representing the storm. Eight sand tiles are placed in a diamond pattern on the desert tiles. In turn players can take 4 actions each. They can move, clear sand off a tile, excavate a tile in hopes of finding water, a helpful tool, the last flying machine in hopes of finding water, a helpful tool, the lost flying machine or a clue to where 1 off the 4 parts are buried. They can also pick up a part once it is located and it isn’t covered in sand. After each player’s turn they will draw a number of cards from the deck of storm cards. The storm deck will cause the storm to move desert tiles, and place a sand marker on any tile that moves. There are also “Sun Beats Down” cards that when drawn cause all players to use some of their water that is in short supply. In addition there are “Storm Picks Up” cards that increase the intensity on the storm meter. The intensity of this game picks up quickly. It only takes a couple of turns to realize how precious the water supply is. Over time it will be clear the sand tokens can run out or the storm meter can reach the top before the team can get everything done they need to get done. Teamwork is essential to keep everyone supplied with water while the search carries on across this Forbidden Desert. This search can be impeded if a player gets 2 or more sand markers on the same desert tile they are on. Then they spend their turn digging out before they can continue their search. 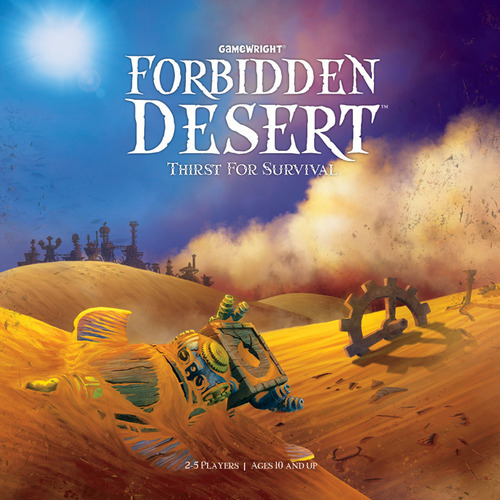 We have an open copy of Forbidden Desert available in our Demo Games Library for you come in and try.